Whim W'Him dancers in Larry Keigwin's "Line Dance"
The day before the Seattle Womxn's March, a dear friend posted on social media a photo of the sign she planned to carry. "Art is What Makes Us Human." I couldn't help thinking of that sign at the closing performance of Whim W'Him's latest evening, "Sensation." The crowd at the Cornish Playhouse at Seattle Center gathered to watch dance, while thousands more descended on Sea-Tac airport to protest the latest Executive Order from the new president that resulted in detentions of hundreds of immigrants at airports across the country. The crowd was abuzz with the latest news. That night, the audience clearly needed to be together; when Whim W'Him Artistic Director Olivier Wevers took the stage before the show, his voice shook as he told the packed house that art was not about building walls. They cheered wildly. Indeed, the three dances on the "Sensation" bill were meant to open windows into universal human experiences. 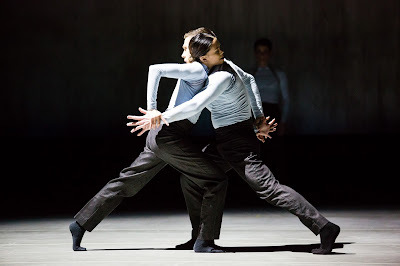 The evening was one of the strongest in Whim W'Him's history, with new works by three choreographers, including the premier of Wevers' dark and emotional "Catch and Release," which closed the evening. Tory Peil and Karl Watson in rehearsal for Olivier Wevers' "Catch and Release"
Wevers' creation was preceded by "Line Dance," New York-based Larry Keigwin's first piece for the company, a quirky, evocative and ultimately lovely dance set to music by Philip Glass. For me, the evening's highlight was a single pas de deux from the program's opening work, "play-by-play," choreographed by Penny Saunders. At a media preview earlier in January, Saunders said this ensemble work is meant as an exploration of the creative process, from the initial idea, through the challenges involved in realizing it. The marvelously expressive Justin Reiter embodied The Idea. Nestled in the middle of Reiter's journey from inspiration to realization is the remarkable pas de deux for Doubt, danced by Patrick Kilbane, and Grace, personified by Liane Aung. They meet center stage, bodies inclined toward one and another from the waist, their arms raised at shoulder height behind them, elbows bent and fingers splayed. Their heads rest in the curve of one another's necks, tender yet tentative. Liane Aung and Patrick Kilbane in Penny Saunders "play-by-play"
Kilbane and Aung proceed to wind around each other like pliant strands of silk. Aung defies gravity as Kilbane lifts her into the air then gently pulls her across his torso. These two dancers are perfectly in synch with one another and with the music. They must have been conscious of the audience, but for the too-short duration of this duet, it felt as if they danced only for themselves. It was a rare and, for me, very necessary reminder of the power of art to lift the human spirit. This past month I've pondered the role of the arts in the new political landscape. Artists can stand up to protest, to create work that comments directly on social injustice and inequity. But they can also give us moments like Penny Saunder's pas de deux; moments that make us shiver at the ineffable beauty of the human spirit.